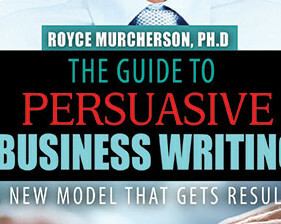 The Guide to Persuasive Business Writing: A New Model that Gets Results is a creative approach to business writing that will help professionals on any level in any industry create smart persuasive communications. So what makes this guide different? How is it going to help you other than providing examples of different types of business documents? This guide is creative in the way it refashions a tried and true model of argumentation still taught in university classrooms into a fresh common sense technique you can learn and use easily. What I attempt to do in this guide is to communicate Stephen Toulmin’s explanation of the pattern of argument in an easy-to-read, easy-to-understand way. The originality of this book lies in the way I apply his model to business writing. It is a user-friendly method for writing persuasive documents that get results. Keep it in your desk, in your briefcase, or your backpack. Just keep it and learn!